When the team at a Banbury care home found out that 96-year-old resident Violet had a hankering to see a Spitfire plane again, they quickly set to work to find a suitable aircraft. Little did they expect that help to fulfil this wish would arrive in the shape of Ruth Langsford and Eamon Holmes as part of their much-loved Channel 5 show ‘Do The Right Thing’. Violet’s wish to see a Spitfire isn’t just a love of old planes. The Highmarket House resident left school during the war and found herself working in a factory in Oxford where they made and repaired Spitfires. Photographs of Violet at the time show a slim, slight woman yet who quickly found herself handling the heavy metal panels that make up the planes. It was a time in her life that is particularly vivid for Violet – not just because she was undertaking such an unexpected role but also that her childhood sweetheart, Fred, had been sent away to Somerset to do his bit for the war effort. 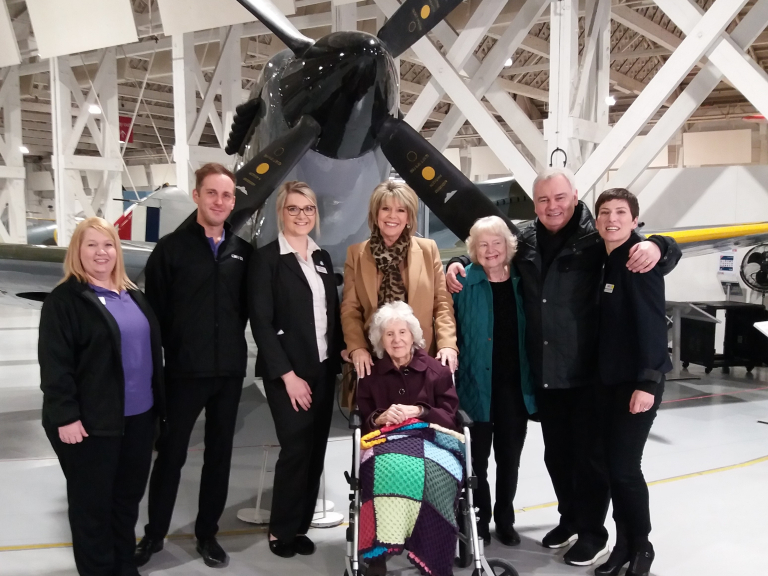 Earlier this year, a plan was hatched with Channel 5 to bring Violet, who lives at the Care UK-run home on North Bar Place, to the RAF museum at Hendon which has not one but four of the iconic World War 2 aircraft. Accompanied by her daughter Shirley and some of the team from Highmarket House, Violet was astonished to find herself chatting to someone she normally likes to watch on TV – Ruth Langsford. After chatting about Violet’s time working at the Spitfire factory in Oxford and looking at photos of Violet as a 17-year-old woman, Ruth and Eamon Holmes took Violet through the museum to see the Spitfire. The moment was captured on film and shown on prime TV last Friday evening. Just to add to a memorable day, the production team also presented Violet with a book, signed for her by the other presenter of ‘Do the Right Thing’ programme Esther Rantzen. The book charts the adventures of Esther’s colourful relative Diana Barnato Walker who flew planes, including Spitfires during the war. Violet’s wish to see a Spitfire came about as a result of a pioneering initiative that is seen in all 120 homes run by Care UK. Each home team collects wishes that residents would like to see fulfilled and these are displayed in the home – usually on some kind of tree. Previous wishes have ranged from having a driving lesson to going back to the stately home where a resident worked as a young woman to enjoying a morning of professional flamenco dancing. One of Care UK’s lifestyle leads, Jon Sneath accompanied Violet to Hendon. Commenting on the day he said: “I truly believe that making wishes come true for residents in our homes is a fantastic way of showing society that, just because you’ve moved into a home, you can still do things you’ve always wanted to do. Violet’s starring role in the ‘Do The Right Thing’ programme on Friday was celebrated in style with residents and team members packing into the home’s cinema to watch the show.